Grafton High School will be host the 2016 BHS Youth in Harmony Super Sing! on January 21st! Stay tuned for more details! Grafton High School has become a top school for Barbershop music in Southeastern Wisconsin. The school currently has three quartets. Grafton's quartets sing a challenging repertoire of music in the barbershop style. Quartets schedule their own rehearsals and get weekly coachings from Barbershop veterans including: Frank Marzocco, Jim Franklin, Jack Ryback, Mike Leidke and Kari Schwartz. 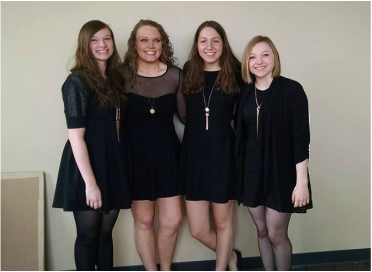 The Quartets have working relationships with Midwest Vocal Express, Heart of Harmony and Crosstown Harmony and perform for these groups throughout the year. If you are interested in joining a quartet please talk to Mr. Qutaishat. The Dinktones have been singing together for two years. The quartet includes Tenor Lindsey Underwood, Lead Hailey Monreal, Baritone Abbey Monreal and Bass Gretchen Geiser. They have competed at the Youth in Harmony state competition in 2015 and 2016. They took 2nd place in 2015 and 6th place in 2016. The Bromantics formed in 2016 and took 6th place at the Youth in Harmony state competion. Members include Tenor Dominic Danner, Lead Peter Danner, Baritone Isaac Brust and Bass Lee Kottke. Past members include Tenor Spencer Knier. The Bromantics occasionally sing with West Allis' Heart of Harmony Barbershop Chorus.